Two residents of Teakettle Village, Cayo District, went to rob a container at the establishment, Cheers Restaurant and Bar, at Mile 30 on the George Price Highway, and one of them was shot dead, while the other has been admitted to ward at the Karl Heusner Memorial Hospital. A watchman for the establishment shot Wellington Hemsley, 29, in the chest, while Gilroy Welcome, 53, had his right hand shattered by a blast from a shotgun held by the other watchman. Hemsley is in the Belmopan Hospital morgue, and Welcome is in police protection at the KHMH. He will be charged by police as soon as he is released from the hospital. The incident occurred around 12:30 yesterday morning, Wednesday. Two watchmen who were on duty at Cheers told police that they were alerted by the surveillance cameras that gave the signal that intruders had been detected. They immediately went into the container area to see what was happening, and saw two men burglarizing a container. One of the two watchmen reportedly fired a warning shot, but the thieves, one of whom was armed with a machete, approached them. One of the watchmen told police that the thief with the machete, Wellington Hemsley, came at him, and he used his 9mm pistol to shoot the thief in the chest. After being shot, Hemsley fell and remained motionless on the ground, he said. Meanwhile, the other thief, Welcome, was struggling with the other watchman to take away his gun. The watchman fired the shotgun, and the blast caught the thief in the arm. The two watchmen then subdued Welcome and held him until police came 20 minutes later from Belmopan. When police arrived, they saw Hemsley lying on the ground, bleeding and motionless. Near him were a large lock cutter and some items already stolen from the container. The two men were then taken to the Belmopan Hospital, where they were identified. Hemsley was declared dead on arrival, while Welcome was rushed to the KHMH. His condition has been declared serious, but stable. Welcome and Hemsley are relatives who live in the same yard, and the Welcome family told Amandala that the incident was a shock to the whole family, who all lived together in nine houses at their estate in the Young Gial area of Teakettle. 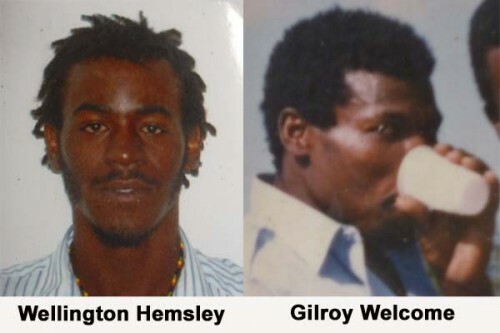 They were at home yesterday when the police came and requested a family member to go to the Belmopan Hospital to identify a body, which turned out to be that of Hemsley. Wellington Hemsley, 29, is survived by his parents, grandparents, five brothers, including Winfield, and a sister. The family has indicated that he will be buried on the family estate. The police have declared that no charges will be brought against the two watchmen.